Headturning, large black and white headpiece by Ascot Couture Milliner Nataliya Tutus. A black smartie base, decorated in a huge wave of black lattice weave sinamay, black and white crinoline folds, black veiling, and adorned with two white silk roses, white quills with Swarovski crystals, and two white butterflies. 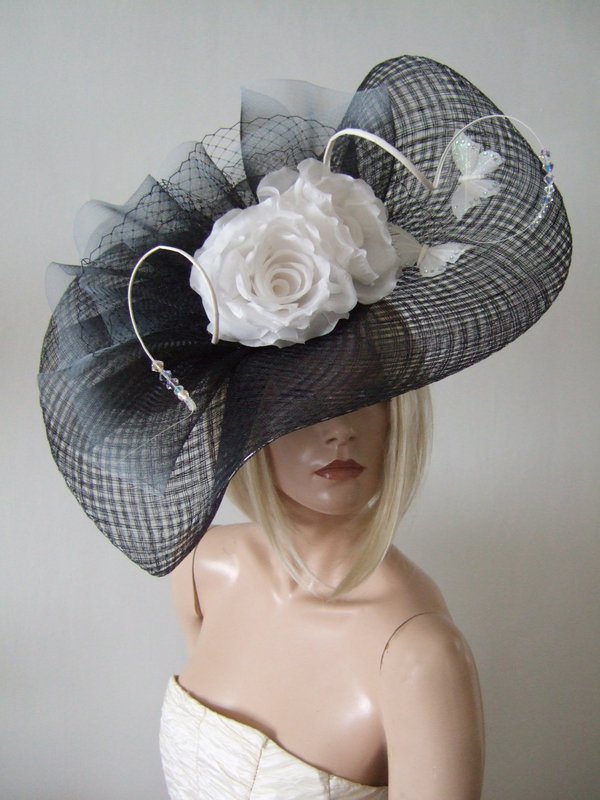 A Great headpiece to turn heads at Ascot, in the never failing monochrome clean black and white colours. £75.00 per day, plus £300.00 deposit refunded on return. Attaches by black thin elastic that wraps under your hair, and holds with the tension fore to back, even on fine or thin hair. Smartie Base 7" x 7", and arrangement height approx 17", and width approx 20.5".